Teamwork Makes the Scene Work: Is your Company up for the Challenge? 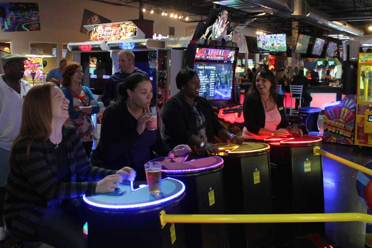 At Scene75, in addition to hosting thousands of birthday parties each year, we host team building events for company parties. These events allow guests to bond while learning leadership and teamwork skills in a super fun environment. I recently interviewed two Scene75 party hosts, Abby and Tyler, to get the inside scoop on what they learned from team building events at Scene75. Both Abby and Tyler were happy to report that they enjoyed their experience as much as the participants. They were quick to point out that adults welcomed the environment and that they had as much energy as any kids who may normally play those same games or attractions. Let me paint a picture for you. Imagine yourself as an eight year old, as the guest of honor of a perfect birthday party, complete with your favorite theme and birthday treats. Feel the energy, a raw energy that may only come once a year to commemorate a special birthday or event. Now picture the glowing smile on your eight year old face after you make a wish while blowing out birthday candles, all while being surrounded by supportive family and friends. Do you feel that childish excitement? Well, while many may think that kids are the only ones able to have that much fun in the real world, adults can unleash their inner child too by bringing back the fun with a company party. Though work and school can bring pressure to our lives, we still have so many events, accomplishments and memories to celebrate. Company parties allow us to celebrate work well done with those who help us achieve our goals. For your next company party, the fun does not have to start and end with dinner. And company parties certainly do not have to be dull or overly formal. By hosting thousands of parties each year for the past six years, Scene75 has learned how to bring back that childish, glowing feeling of fun to adult parties. Though Scene75 hosts company events of different styles, Scene75’s teambuilding structure provides a fun way to take the pressure off and to bond and learn from coworkers. In fact, team building at Scene75 brings a competitive and memorable experience for companies of all sizes. For larger groups, our party hosts divide the company guests into teams who then compete in a number of attractions chosen in advance at time of booking. Party hosts Abby and Tyler get to see firsthand how excited Scene75 guests are when bringing out their competitive nature. What they shared with me was intriguing. At first, they explained, the party room can be quiet as guests prepare for the events of the day and get a feel for the tone of the environment. But within minutes, our trained party hosts liven the experience to help create lasting memories for our guests. 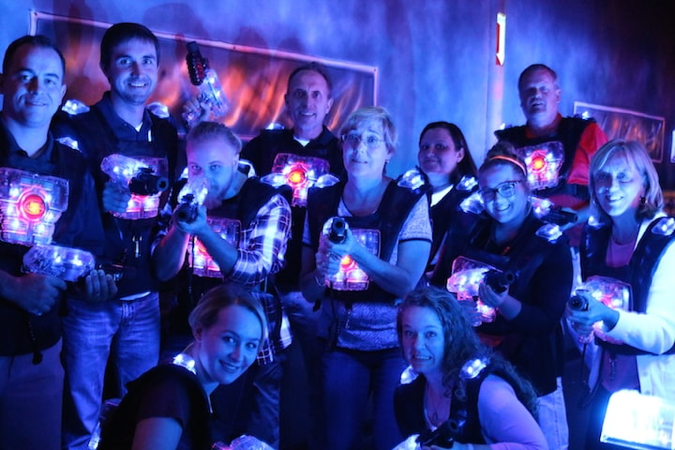 As guests settle in and begin to compete against their colleagues on their chosen attractions, whether it be laser tag, go-karts, blacklight mini-golf or something altogether different, they find themselves learning new things about their teammates. This process of learning leads to friendship, camaraderie, and most importantly, trust – which Patrick Lencioni, author of the Five Dysfunctions of a Team (a book our managers study), writes is the foundation of any successful team. For Abby’s first team building party, she was a little unsure as to what to expect because she had mostly worked birthday parties for children. Abby reluctantly shared that she was “nervous at first to be in charge of people older than her” but she learned from watching the hit comedy show, The Office, that “workers can be fun too!”. Abby acknowledged that sometimes they just need a little push or perhaps a reason to have fun…and that is exactly what Scene75 provides! Abby learned how fun it is when guests “start to come out of their shells and actively engage in the activities.” Abby indicated that while her guests learn a great deal about each other, hosting company events has also helped her learn, namely in developing her own leadership skills. She loves to see others have fun and attests that team building is great for any age group. It helps build character and creativity. Ready to learn more or to book a team building event for your company? We would love the opportunity to help you plan a day of fun, learning, competition, and lasting memories.